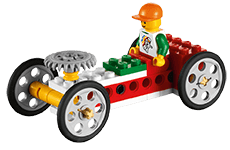 Machines & Mechanisms from LEGO® Education shows students how the world works. Machines affect our lives every day. When students understand how they are built they can apply that knowledge to improve machines or even create new ones. Get students in gear using Machines & Mechanisms. Introduce them to gears, levers, pulleys, wheels and axles and other simple mechanical devices. Students also gain an understanding of energy, force, motion, structures and other physical science principles. The supplementary Curriculum Packs helps students connect the models they build to real-life science principles. The portfolio offers tiered products that enable students from Preschool through to Middle School to explore and investigate real-world actions and reactions. With Machines & Mechanisms, students work as scientists and engineers to seek answers and design creative solutions. Let’s ignite machines and mechanisms together! First teachings on the operation of gears, levers, pulleys, wheels and axles. Simple explanations about the daily structures for the little ones. Introduce second- and third-graders to the basic principles behind gears, wheels, axels, levers and pulleys. It helps students to investigate everything from the principles of basic mechanics to the most complex motorized machines. The place to learn how do things work! FAQs, downloads and machines and mechanism technical support.